With our move from Vienna to Munich and all the logistic and administrative things of the last weeks, Sai Island seems like ages ago, but in reality only 5 weeks have passed since we left Sudan! 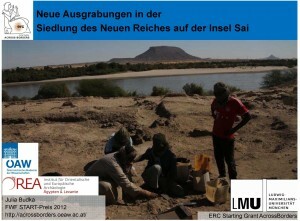 Especially because of this sensed long distance, I am very happy that Sudan and archaeological work there is the focus of an upcoming event here in Munich. Tomorrow’s lecture event dedicated to Sudan in the Egyptian Museum Munich is also the perfect opportunity to present AcrossBorders’ most recent results to an audience in our new German home. I am very grateful for this chance to introduce my project and to talk about latest findings, new questions and planned tasks. Fieldwork within the New Kingdom town of Sai in 2014 and 2015 will be the focus, but I will also mention our newly discovered tomb in cemetery SAC5. 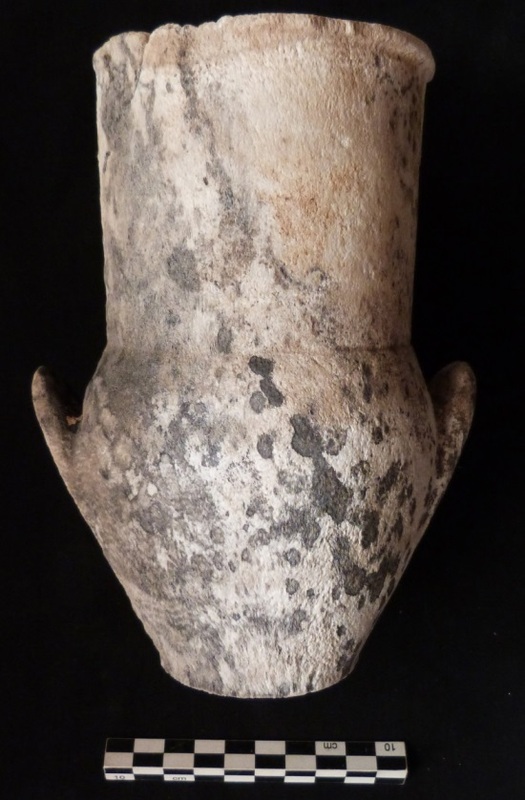 To illustrate the potential of tomb 26, I will show some of the nice complete pottery vessels from the shaft bottom. Together with the marl clay pilgrim flasks and amphorae, one almost complete stone vessel, SAC5 212, was found in the southeastern corner. Stone vessel SAC5 212 found at the bottom of the shaft of tomb 26. This clustering opposite of the entrance to the burial chamber already suggested that the finds are remains of a burial which was removed from the chamber and left in the shaft during one of the phases of reuse (or possibly plundering?). 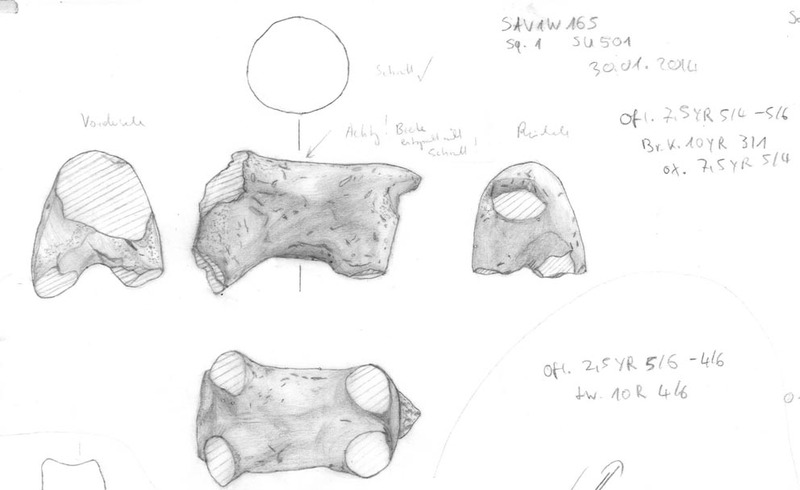 One finding from the burial chamber supports the assumption that the remains on the shaft bottom were originally deposited in the chamber: A small rim fragment of the almost complete stone vessel SAC5 212 was discovered in the debris just inside the burial chamber. Post-excavation processing was unfortunately slowed down because of the transfer of the project, but I am positive that we will soon have results from the ongoing studies of the ceramics, small finds, landscape and micromorphology! This week work focused again on fieldwork in the cemetery SAC5 and registration and studying of various find categories in the dig house. 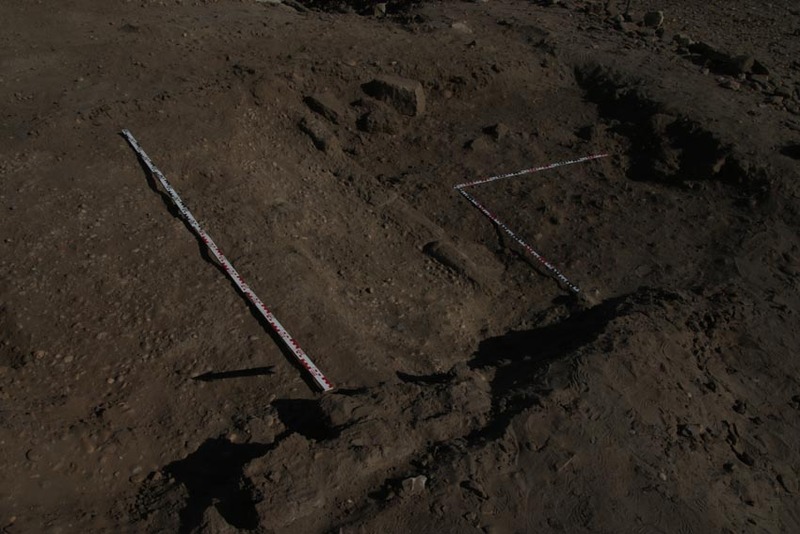 Excavation in area 1 in the southern part of SAC5 proved to be very interesting: we now know that this large sector set between two small hill outcrops probably was completly void of tombs. No burial monuments were located, but rather various interesting topographical features exposed – Martin Fera will compose a digital landscape model in the next weeks attempting a first interpretation of this topography. The fresh information will allow some new insights into the landscape, evolution and size of the New Kingdom cemetery SAC5. Area 1 with newly exposed topographies. In agreement with Florence Thill, we started digging another area in SAC5: area 2 is located north of area 1, just next to various 18th Dynasty monuments like tomb 8. 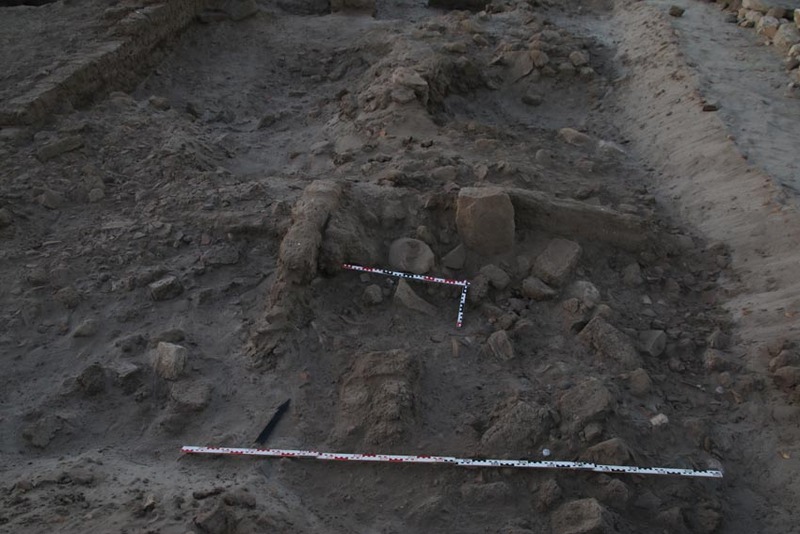 The surface material discovered so far covers all the periods attested for the use of SAC5 as a burial site: mid-late 18th Dynasty, Late Ramesside, Pre-Napatan and Napatan. Today, a sandy depression was found, surrounded on three sides by bedrock – we’ll continue excavating there, of course hoping for a shaft opening belonging to a new tomb. Promising new area 2 in SAC5. Feature 15 keeps us busy in the digging house – most of the washing of the ceramics is now done, but sorting is still ongoing. 60 vessels have been reconstructed so far – dozens of more are still waiting to be joined. 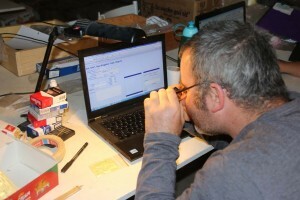 Oliver Frank Stephan concentrates on drawing the complete profiles and reconstructed pots. 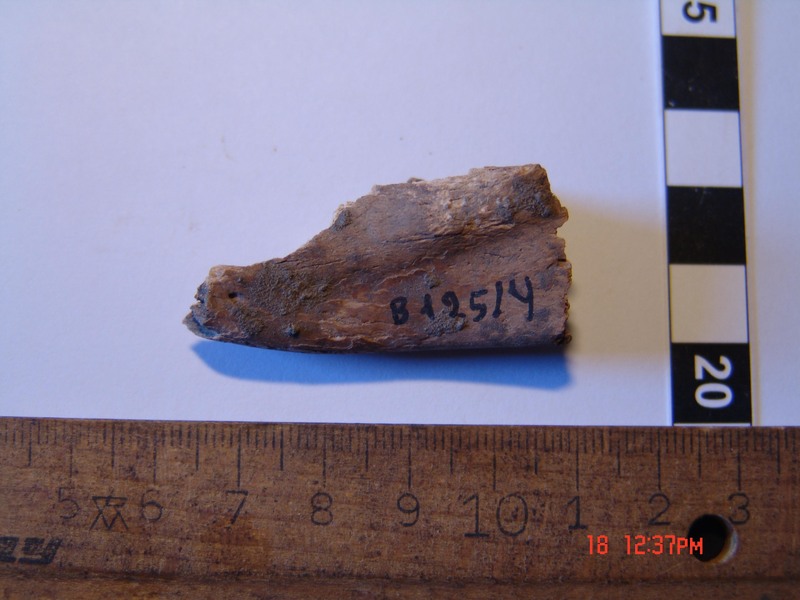 Registration of finds from feature 15 continued – Ken Griffin and Meg Gundlach have been very productive in entering different types of objects into the database. By now, a total of 329 small finds were registered from feature 15! And I am not yet done with sieving, some bags with material from directly above the pavement are still unchecked, for sure comprising more objects. Already 171 seal impressions were documented, mostly dating to Hatshepsut and Thutmose III. We continue to be a bit baffled about the large amount of clay sealings from such a small structure! Exciting: this week a substantial number of new seal types were registered. Sabine Tschorn started with drawing representative fragments of faience vessels – most of which are Nun-bowls, but other shapes like small chalices are also attested. The number of fragments from SAV1 West is much higher than from SAV1 East – probably related to the different character of the areas, but it could also be explained by the slightly later date of deposits in SAV1 West. The late 18th Dynasty, a well-known heyday of faience production, is better attested in our western area than within the surroundings of Building A towards the East. Happy about small, but diagnostic pieces of Nun-bowls from SAV1 West. Last but not least I am very thankful to Stuart Tyson Smith and his team for welcoming us this week in Tombos – we got a splendid tour through the cemetery and the town site. There are many parallels to Sai Island and I am looking much forward to future results of the Tombos mission and a continous open exchange and collaboration. It has been a very busy and challenging week – very hot and loads of biting nimiti-flies in the first half, now a bit cooler and windy. Giulia D’Ercole, Huda Magzoub and me went to Kerma for our very successful pottery workshop, bringing together a number of colleagues working at other New Kingdom sites. During the two days we were gone from Sai, Martin Fera, Stefanie Juch and Jördis Vieth supervised the cleaning of SAF2, the so-called governor’s residence. Despite the splendid results of the Laser Scanning Campaign in 2014, we were aiming for a better understanding of this key building in the southern part of the town, especially its pavements. Ingrid Adenstedt, presently busy working from back home in Vienna, will include our new SFM model from this season for her general reconstruction of the Pharaonic remains in the town area. Martin Fera – fighting nimiti and taking SFM photographs of SAF2. In the magazine, Giulia was busy collecting new samples for our iNAA analysis – the current focus is on what we assume to be Egyptian Nile clay wares, produced in Egypt and imported to Sai. We sampled already a number of cooking pots in 2014 – now various types of dishes, plates and small beakers will be tested. Ken Griffin and Meg Gundlach continued their fantastic job of organizing the storage of finds after the registration of each object – everything from small faience beads to re-used sherds, figurines, curious wooden objects, abundant stone tools to architectural pieces. At SAV1 East, work focused on Square 4 and 4a. As reported in an earlier post, we found new sections of walls in this southern part of the area. Today a large area still covered with what seems to be an early 18th Dynasty pavement was unearthed in the southwestern corner. We are very exciting about this good state of preservation and will continue in this part of SAV1 East in the upcoming week! New sections of mud brick walls and remains of a nice pavement in the western part of SAV1 East. At SAV1 West, Martin Fera and Stefanie Juch focused on the eastern half of Square 1S. In the last two days, we managed to join this new trench with Square 1, excavated in 2014 by removing the latters southern baulk according to its stratigraphy. The deposits and findings in both squares closely resemble each other and allow to a much better understanding of the occupation phases within the town. Present status of eastern half of Square 1 and Square 1S in SAV1 West. 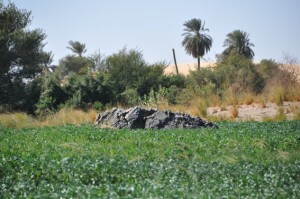 At present, the dating of the exposed mud brick structures sitting on stratigraphic layers and cut by later pits is still unclear – there are hints for a date much later than the 18th Dynasty. However, checking today’s pottery from Square 1, there was quite a pleasant surprise: the uppermost filling, still covering what seems to be the early occupation (with several phases), yielded a significant amount of early 19th Dynasty sherds! This is extremely exciting! We know of course about activities under Seti I on Sai, but until today these were scattered and fragmented finds, archaeological proof of a continuous occupation is still lacking… Much potential and many open questions for our next week of work! Furthermore, during this week Miranda Semple, the project’s micromorphologist, started sampling with a focus on SAV1 West. Especially promising are samples from the small “wall street” running along the town enclosure wall potentially highlighting daily activities such as waste but also giving information about the maintenance of the street etc. Simultaneously with the excavation, the first micromorphological samples were taken this week. Samples from inside the newly exposed buildings will complement these street remains and hopefully help us to understand the very complex formation processes at SAV1 West. Sayantani Neogi, the project’s geoarchaeologist, was very busy these days with research on the sandstone cliff along the eastern side of the town and the question of a possible landing place during the New Kingdom. Her first observations are already highly interesting and important for reconstructing the past landscape. All in all, the first four weeks of AcrossBorders’ 2015 field season were extremely productive and have yielded significant new data – confirming results from the last seasons, but also giving room to new thoughts and innovative lines of research. This week was extremely busy and successful – in both areas (SAV1 East and SAV1 West) new mud brick walls were discovered and the number of finds and pottery increased much. Object registration continues by Kenneth Griffin and Meg Gundlach – the database comprises already 2576 objects ranging in date from the Paleolithic Period to Ottoman times. The number of items datable to the 18th Dynasty rises with every day of fieldwork. The cowroid fayence amulet SAV1W 723. One of the highlights among the small finds from this season is definitely an intact, small cowroid fayence amulet depicting the goddess Taweret on its flat side. It was found close to the bottom surface of the town wall’s foundation in Square 1S. In Square 1S, Martin Fera, Stefanie Juch and their gang of workmen have exposed some fragile street deposits in the lane running along the inner side of the town enclosure as well as in situ mud brick structures in the eastern half of the square. A particularly promising structure is located in its southeastern corner – still filled with dense mud brick debris, worked stones and pottery fragments its date remains to be clarified in the upcoming week. Promising mud brick features in Square 1S, Southeastern corner. At SAV1 East, Jördis Vieth, Huda Magzoub and their team of local workmen have exposed more remains of pavements and new sections of walls in Square 4. Due to the poor state of preservation, work here is very challenging – I am nevertheless very positive that we will be able to understand the stratigraphical relations of the scattered remains in the next weeks. The present working hypothesis is that there are early 18th Dynasty structures in the southern part of Square 4 – pre-dating Building A and finding close parallels around Temple A (excavated by Michel Azim) and in Square 2 of our excavation (storage bin feature 14). 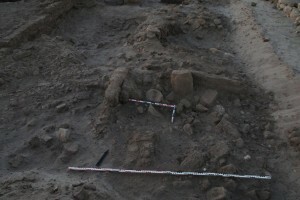 Remains in the southern part of SAV1 East, probably earlier than Building A. Furthermore, Giulia D’Ercole joined us this week – she has already started to sample pottery vessels for iNAA analysis in Vienna. The focus of the 2015 season is on Egyptian style vessels – both imported ones from Egypt and locally produced wheel-made vessels. Geoarchaeological research by Sayantani Neogi and Miranda Semple commenced this week as well – they successfully surveyed parts of the hinterland of the New Kingdom town. Miranda starts sampling archaeological deposits for micromorphological analysis at SAV1 West next week. Micromorphological research at Sai will start with the sampling of street deposits at SAV1 West. All in all, everything worked out according to schedule with more than satisfying results so far – and with two weeks of fieldwork in the town waiting for us! In a few days, the first group of team members of AcrossBorders will be on the way back to Sudan. 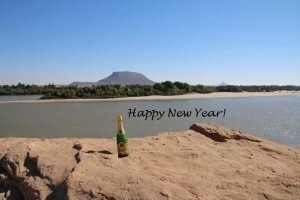 We will travel via Khartoum to Sai Island and will start our third season on January 1 (insha’allah). As in the previous seasons, AcrossBorders will focus on the New Kingdom on the large island of Sai. We plan to work in different sectors within the town area and to renew work in the New Kingdom cemetery SAC5. The 2015 fieldwork will concentrate on the continuous excavation at SAV1E and SAV1W in the New Kingdom town, the new excavation of presumed tombs in cemetery SAC 5 and the documentation of already excavated material from SAV1N, SAV1E and SAV1W (sorting and recording of the material in the courtyard and working room). One of the main goals of the project is to improve our under­standing of the population on the island and to explore the nature of the coexistence of Egyptians and Nubians. A comparison between the material culture from the Egyptian style cemetery and the Egyptian town will be highly relevant in this respect; human remains will offer multiple aspects for analytical research, especially for studies of biological identities. 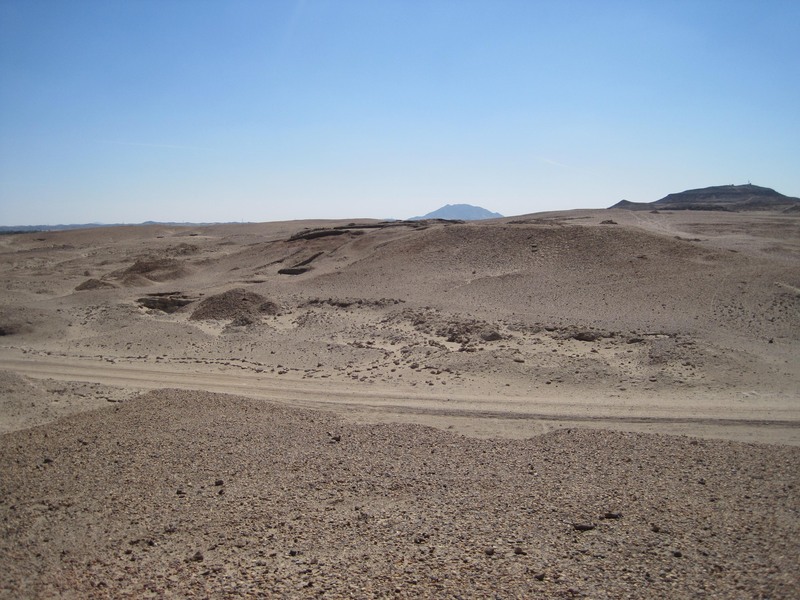 Continued fieldwork in the site to the east of the Pharaonic town, labelled SAV1E, investigated for the first time in 2013, is planned for 2015. The orthogonal structure called “Building A” was largely exposed; we aim to finish the complete excavation of this important complex of the mid-18th Dynasty. Contemporaneous to the excavations, the pottery will be studied. New fieldwork in a site to the west of the Pharaonic town, labelled SAV1W, was started in 2014. The western enclosure wall was traced in two squares and brick work datable to the 18th Dynasty exposed. Very promising New Kingdom deposits have been noticed within the town, to the east of the enclosure wall – several phases for these structures are visible in sections of Post-Pharaonic pits. This interesting area of 18th Dynasty occupation will be the focus of the 2015 season. Contemporaneous to the excavations, the pottery will be studied. 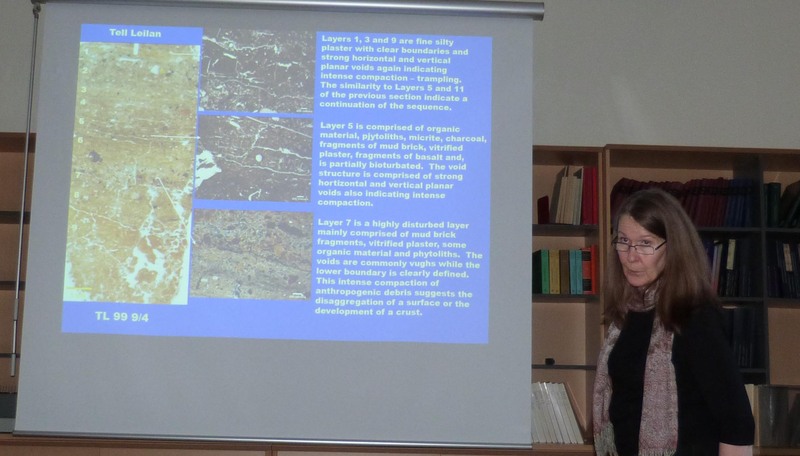 Work will also focus on a detailed study of the stone tools from SAV1W by Silvia Prell. 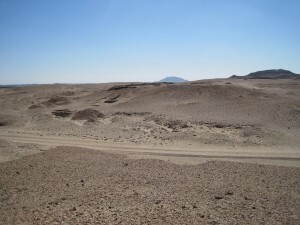 In 2011, a geophysical survey was conducted in the area of the most important New Kingdom cemetery of Sai, SAC5 to the South of the Pharaonic town. We plan to excavate unexplored tombs visible on the magnetometric map of the cemetery, starting with the surroundings of tombs 14 and 15 in the southern part of the cemetery. Our work will include besides the study of the architecture, finds and human remains Structure-From-Motion techniques to create a 3D model of the cemetery and especially of the newly exposed tombs. 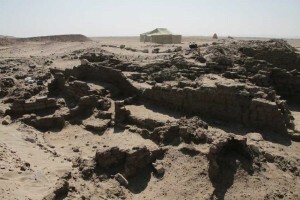 The New Kingdom cemetery SAC 5 to the south of the Pharaonic town (view from the north). I am especially happy that Florence Thill (Lille University) will join us during the excavations in the cemetery and will offer her expertise based on her previous work in SAC 5. This year, the team will be strengthened by two geoarchaeologists, Miranda Semple and Sayantani Neogi. They will build upon the geological survey conducted in 2014 and will focus on questions of the location and nature of the ancient harbour and the ancient stone quarries. 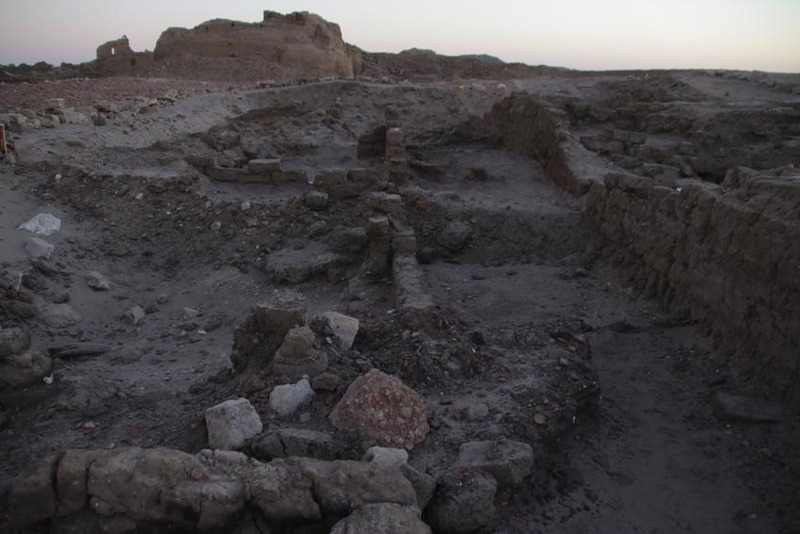 Furthermore, they will collect samples to investigate the micromorphology of the Pharaonic town, focusing on formation processes and cultural activities. It is planned that they will compare the different excavation areas (SAV1N, SAV1W and SAV1E as well as SAV1) to each other. 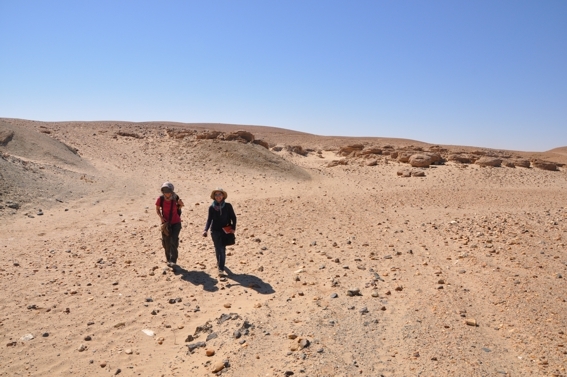 Environmental and climatic settings and changes during the New Kingdom will be focal points in the next years – being investigated by surveying, drilling and test pits. Furthermore, I am very happy to welcome Frits Heinrich (archaeobotanist) and Jaime van der Heul from Groningen University as external experts – they will conduct archaeobotanical research and will take relevant samples in different areas of the town. Without doubt another busy season is waiting for us – with renewed work in the cemetery, there will be fresh challenges and for sure a lot of new material. Thanks to all of the support by our Sudanese friends and colleagues and of course due to the joint efforts of all team members, I am more than confident that the results will be amazing and the 2015 season again very productive and highly interesting. Looking much forward to travel to Sudan and wishing all team members & friends of AcrossBorders very happy holidays and a perfect start into 2015! Time flies by: AcrossBorders is by now already in its third year! 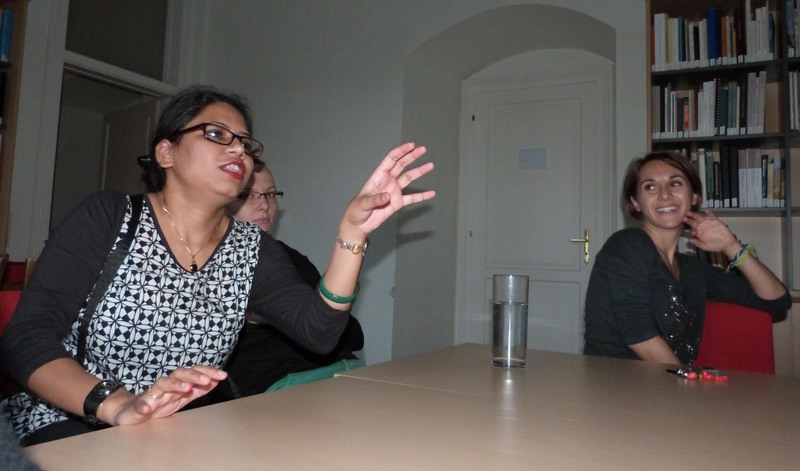 Having just returned from a very successful season at Elephantine (thanks to our good cooperation with the Swiss Institute Cairo), I am more than happy that we just held a kick-off meeting in Vienna (Dec 8-9): Our new colleagues from the Charles McBurney Laboratory for Geoarchaeology in Cambrigde, Sayantani Neogi and Miranda Semple, joined us for two days of sharing information, ideas and thoughts about possible applications of micromorphology and geoarchaeology on Sai Island. Microarchaeology, commonly applied to investigate formation processes on sites in Britain, Turkey and Syria (and very successfully by our colleagues working at Amara West), can provide astonishing results in uncovering human activities in seemingly insignificant traces within archaeological sections. Micro­morpho­­logy and geochemistry will therefore be applied to investigate formation processes and cultural activities within the town site of Sai. Both anthropogenic activities and natural processes will be investigated by chemical analyses, petrographical studies and thin sections of archaeo­logical deposits. 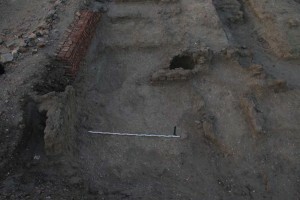 There will be a particular focus on floors, walls and archaeological deposits within open areas. 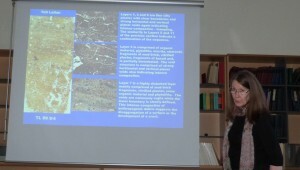 Miranda explaining some of her previous studies at sites in Syria. Miranda is our new specialist for investigating activity areas and more in the different sectors of the Pharaonic town – the focus of her research will be on sampling contexts from our current excavation in SAV1 West. 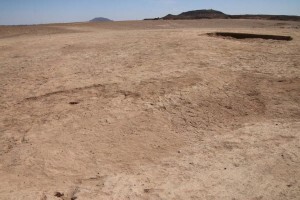 Sayantani has conducted landscape archaeology in different parts of the world, e.g. in India and Spain. Sayantani will concentrate on the landscape archaeology and the environmental setting of Sai Island during the 2nd millennium BC. For the upcoming season, sampling of relevant sections, drilling and test pits are planned as well as a detailed geoarchaeological survey in the area of the Pharaonic town and the New Kingdom cemeteries. All of this will happen of course in close exchange with us working on the architecture, pottery, faunal remains and other finds. Giulia sharing some of her observations on the petrography of our ceramics. I am much looking forward to our 2015 season and I am delighted that thanks to the strong interdisciplinary approach of AcrossBorders, the project is now applying multiple methods, including micro- and geoarchaeology with physical and chemical analyses of samples. This would not be possible without the support of several colleagues and here I am especially grateful to Charles French and his lab in Cambridge (Charles McBurney Laboratory for Geoarchaeology). In the last months, a total number of 492 faunal remains were identified and analyzed from the New Kingdom town of Sai Island. The identification and analysis of species was carried out on Sai Island during the field season 2014 and it was continued in Vienna (Austria) at the Museum of Natural History (1st Zoological Department, Archaeozoology) and at the Department of Palaeontology (University of Vienna). My sincere thanks go therefore to the Sudanese Authorities (NCAM and especially our inspector Huda Magzoub) and also to Dr. Erich Pucher and Dr. Karl Kunst for their constant support here in Vienna! The bone deposits derive from SAV1 North within the New Kingdom town of Sai, from three levels numbered from 5 to 3, datable to the 18th Dynasty (see Budka and Doyen 2013). Human intervention related to butchery techniques has been detected on the faunal remains from all levels investigated. 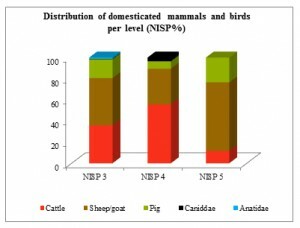 Diagram 1: Distribution of mammals and birds from Sai Island, SAV1 North according to the Number of Identified Specimens (NISP) for levels 3-5. 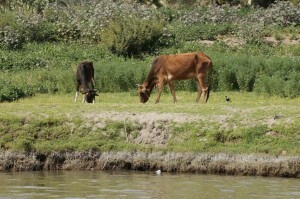 The prevalent species are mainly sheep/goats and cattle, but with some differences from level 5 to 3. The faunal composition demonstrates the prevalence of domesticated mammal species at SAV1 North (Diagram 1). However, the very limited number of bones available from good archaeological contexts (levels 5-3) has to be stressed ‒ the material did not allow statistical processing and all results are of a tentative character based on a restricted corpus of faunal remains. Yet, I do believe that there is rich potential in the study of the animal bones from the New Kingdom town area of Sai, especially with the new stratified material from recent excavations as in SAV1 West, still waiting for analysis. Today, I would like to present some first data concerning one of the interesting species among the attested mammals: the pig (Sus scrofa f. domestica). Pigs are recorded at a relatively higher percentage, after sheep/goat, at level 5, but a reduction follows at level 4. The profile changes at level 3, where the number of the bones is again increasing. Pigs correspond to 8 bones from level 5, 10 from level 4 and 55 from level 3. As it is illustrated in Diagram 1, they are found at a relatively high percentage at level 5. Evidence from level 4 demonstrates that cattle and caprine prevail, whereas pigs are found in a smaller number. Pigs remain just the third prevalent species at level 3, although the total number of bones is higher. For level 5 and the small number of bones, the skeletal part distribution is not well understood. A small amount of vertebrae, humerus and dentes are noted for this level. Dentes, tarsals and pelvis have mainly survived from level 4. More remains have been recovered from level 3. Mandibles prevail (14.5%) followed by humerus (10.9%), costae (9%), radius (7.2%) and pelvis (7.2%). Smaller bones (carpals, tarsals, and phalanges) lack completely. The analysis of the age profile shows that the vast majority of the material coming from level 3 belongs to individuals between 1 and 2.5 years. Some of them are younger than 1 year and only in one case up to 3.5 years. The dental examination confirms the young age for the majority of the animals (16 months). Level 4 presents mainly individuals younger than 2-3 years and in one case older than 3.5 years. From level 5 only one individual is recorded, which seem to be younger than 1 year. The butchery marks recorded on pigs are mainly related to disarticulation and portioning. 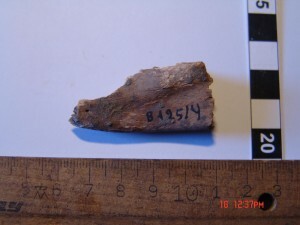 Mandibula of a pig from Level 4. Proximal part of a humerus from Level 4. To conclude, pigs recovered at SAV1 North were slaughtered at the optimum age for meat consumption. The very rare cases of older pigs could be related with the needs of reproduction. 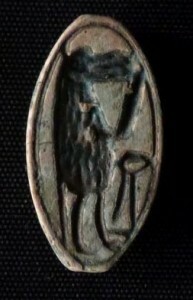 It is noteworthy that as far as we know pigs in Nubia are mainly connected with Egyptian presence. For instance, the pyramid tomb G301 at Cemetery D of Amara West (19th Dynasty) brought to light a neonate piglet from the western chamber (Binder et al. 2011, 53). On the other hand, pigs have not been found at Kerma in the town or cemeteries (see the studies by L. Chaix, e.g. 1988 and the extensive list of publications available at http://kerma.ch/index.php?option=com_content&task=view&id=40&Itemid=79#animal). In New Kingdom Egypt, pig is among the most numerous species killed for meat and a preference for young animals is traceable in settlements (see e.g. at Amarna, Kemp 2012, 219-220). 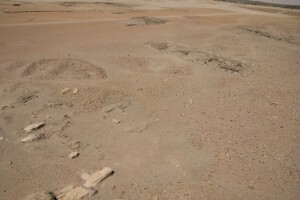 It can be very tentatively suggested that the presence of pigs in the earliest level 5 at SAV1 North corresponds to the analysis of the ceramics from the same contexts: The material is New Kingdom in date and Egyptian in character, supporting the assessment that a Pharaonic settlement was founded on the island very early in the 18th Dynasty (cf. Budka 2011; Budka and Doyen 2013). For now, only some preliminary tendencies for the faunal material from the New Kingdom town of Sai have been outlined. The low amount of the material studied so far has to be taken in consideration, implying that the results might significantly change during the next campaigns. However, the case study of the pig remains from SAV1 North illustrates that the study of the faunal remains from Sai will significantly contribute to the interpretation of the character of the site during the 18th Dynasty. Binder et al. 2011 = M. Binder, N. Spencer & M. Millet, Cemetery D at Amara West: the Ramesside period and its aftermath, British Museum Studies in Ancient Egypt and Sudan 16, 2011, 47–99. 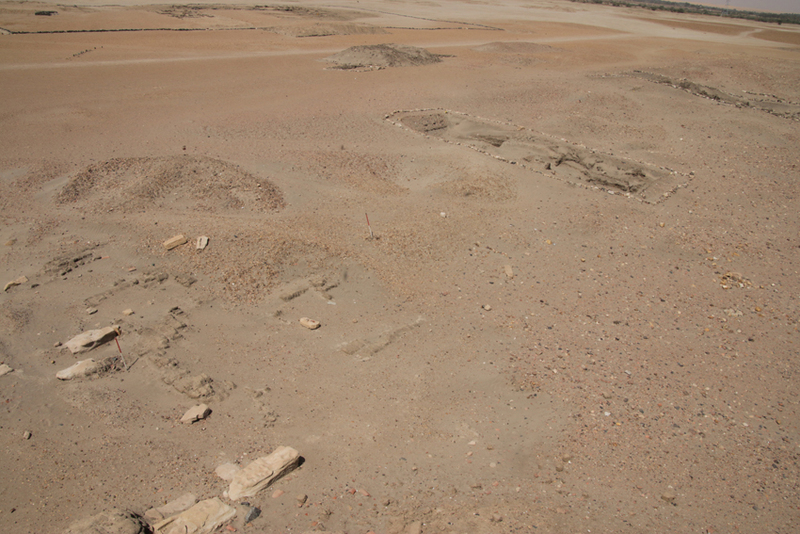 Budka 2011 = J. Budka, The early New Kingdom at Sai Island: Preliminary results based on the pottery analysis (4th Season 2010), Sudan & Nubia 15, 23–33. Budka and Doyen 2013 = J. Budka & F. Doyen, Living in New Kingdom towns in Upper Nubia – New evidence from recent excavations on Sai Island, Ägypten & Levante 22/23, 2012/2013, 167–208. Kemp 2012 = B. Kemp, The City of Akhenaten and Nefertiti. 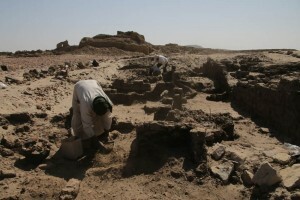 Amarna and its people, Cairo 2012. 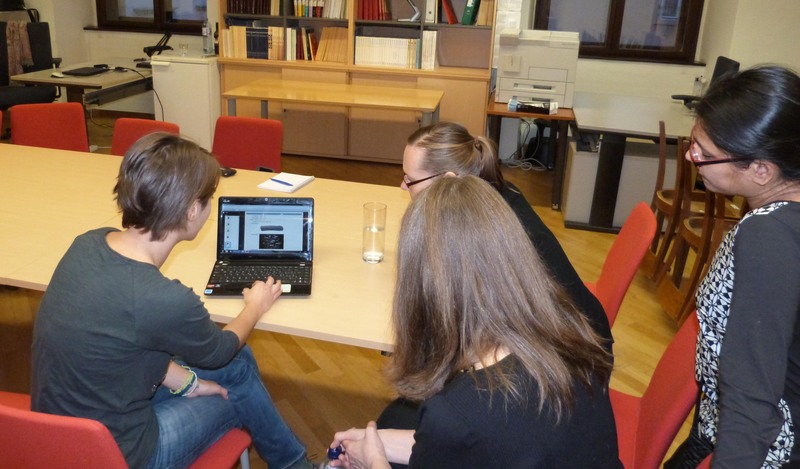 Spending some days in Berlin, I just had the pleasure to meet Nicole and Julia – this season’s registrars of objects who did a great job on Sai! Reviewing the database and object drawings, I’d like to share some thoughts on animal figurines we encounter in the Pharaonic town of Sai. At all three sites currently investigated by AcrossBorders – SAV1 North, SAV1 East and SAV1 West, mould-made animal figurines, especially of horses, have been found in the upper levels and in mixed fillings of pits cut into the Pharaonic brick work. They are of Medieval date and complement the small corpus of human figurines from the same period. In addition, all excavation areas have yielded small, hand-modelled clay figurines of humans and in particular of quadrupeds. 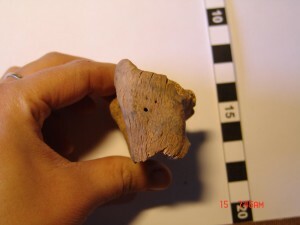 The clay is usually poorly fired and most figurines are only fragmentary preserved. There are a few rams attested, but the majority represents cattle. As of now, 8 bull figurines have been found at SAV1 North, 1 piece at SAV1 East and 3 figurines at SAV1 West. Pencil drawing of one of the new figurines from SAV1 West. 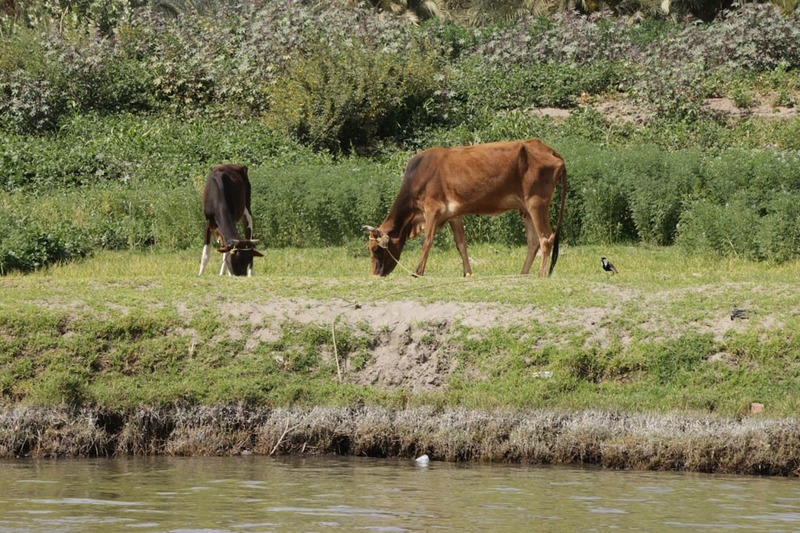 The cattle figurines seem to be of 18th Dynasty date and the question arises whether they fall into the well attested Nubian tradition to value cattle highly – especially because the clay figurines might indicate household religious practice and cattle played an important role in Nubian religion (Smith 2003, 133). The prominence of Nubian cattle survived the Kerma kingdom, the animals had a key significance for the Egyptians during the New Kingdom. Our small clay figurines find ready parallels at several sites in Nubia, for example at Quban (Emery and Kirwan 1935, fig. 33) and Askut (Smith 2003, 135, fig. 5.32). At Sai, a particularly well preserved piece was discovered in the so-called governor’s residence, SAF2, during French excavation in the 1970s. Cattle figurine from the so-called governor’s residence. 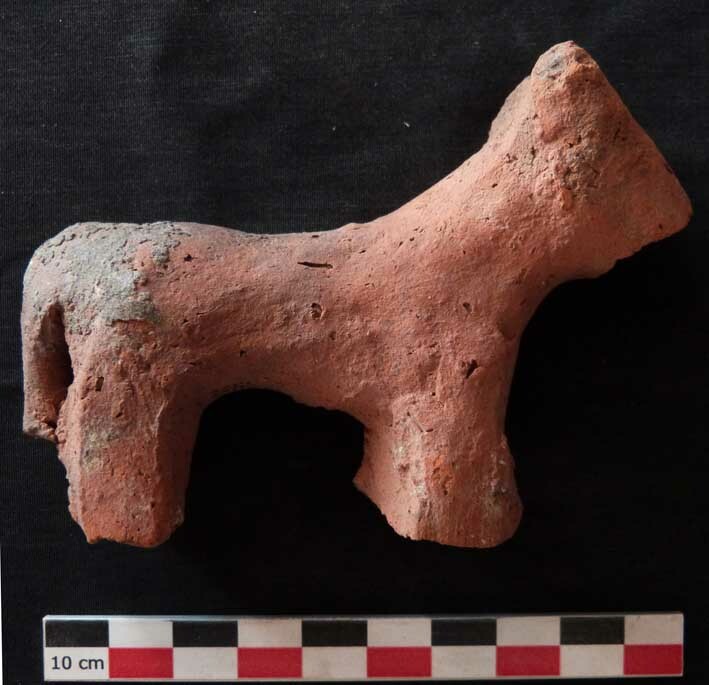 I do hope that upcoming work at SAV1 West will allow us to contextualise the group of cattle figurines in more detail and to confirm their date as New Kingdom. With future finds, we will then be able to continue thinking about the symbolic value and function of these simple but very appealing representations of important animals. Emery and Kirwan 1935 = W. B. Emery and L.P. Kirwan, The Excavations and Survey between Wadi es-Sebua and Adindan 1929-1931, 2 vols., SAE, Mission archéologique de Nubie 1929-1934, Cairo 1935. Smith 2003 = St. T. Smith, Wretched Kush. Ethnic identities and boundaries in Egypt’s Nubian Empire, London and New York. 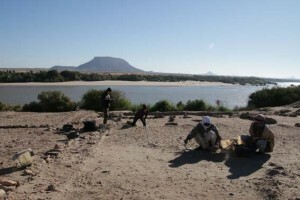 The aim of the geoarchaeological fieldwork within the framework of AcrossBorders was to expand our knowledge about the existing rock types, their relationships, Quaternary sediments, geomorphological evolution and estimations about possible Nile erosion processes at the site of the Pharaonic settlement. The scarcity of vegetation, presence of riverfront exposures as well as excellent outcrops provided by excavated graves offer great geoarchaeological working conditions. 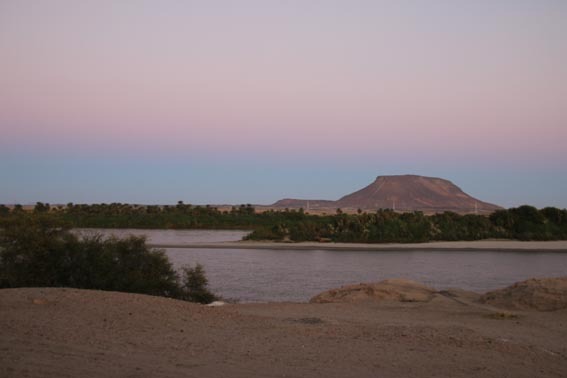 Sai Island is situated between the 2nd and 3rd Nile cataracts, which are a result of a large scale east-west trending tectonic uplift zone, which forces the Nile to incise into uplifted Neoproterozoic crystalline basement and its sedimentary cover (Thurmond et al. 2004). Consequently, Sai Island comprises medium-grade metamorphic Precambrian rocks (amphibolite, dolomite, quartzite, biotite gneiss, calcite marble) in the west and southeast, dipping around 30° towards the Northwest. These rocks are commonly cross-cut by large quartz-veins. In the central and northern part of the island these meta-volcano-sedimentary rocks are overlain by subhorizontal Nubian Sandstone, mainly consisting of medium- to coarse-grained fluvial quartz sandstone, conglomerate, rare siltstone and occasional silicified wood. 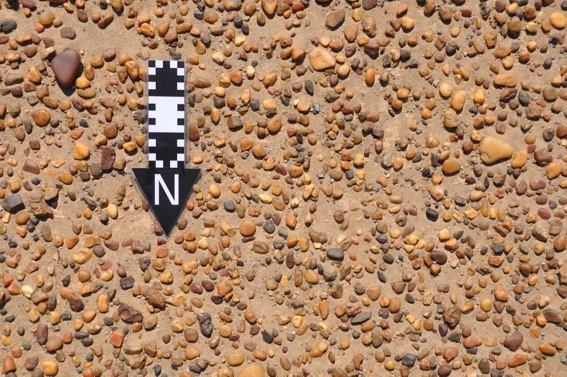 Almost all of these rocks are covered by thin layers of comparably much younger Nile sediments (in some places with Palaeolithic artefacts) and only the Nubian Sandstone of Jebel Adu raises as an Inselberg from the flat terraces surfaces (van Peer et al. 2003, Anonymous 2005). The pre-Holocene Nile sediments mainly comprise gravely channel deposits and fine-grained floodplain sediments. 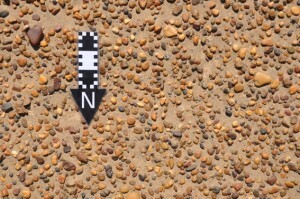 The sub-rounded to rounded gravel of the pre-Holocene Nile terraces are strongly dominated by quartz clasts, followed by chert and beautiful agate and virtually free of carbonate clasts, while the fine-grained floodplain sediments commonly show soil formation processes and related calcrete (Lewis et al. 2011). The rock types occurring at the site of the Pharaonic settlement in general reflect the geological reality of the island and most of them are locally available. By far the most common rock types are quartz sandstone and amphibolite, while vein quartz, calcrete, biotite gneiss, calcite marble are comparable rare. Rock types which probably have been brought to the island include granite, diorite, gabbro and gypsum. Anonymous, Geological map of Sudan. 1 : 3,500,000, Geological Research Authority of the Sudan, Khartoum, 2005. 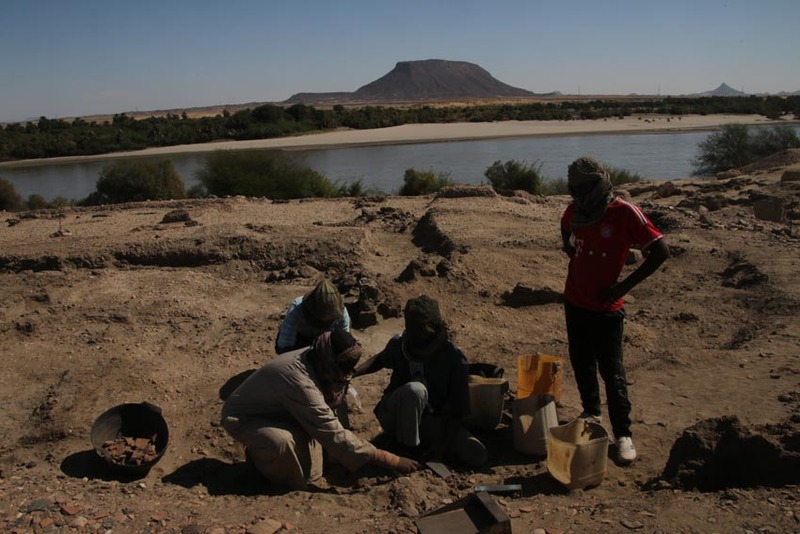 J. Lewis, J. Smith, & E. Garcea, Paleoenvironmental implications of the isotope geochemistry and granulometry of Quaternary alluvial sediments and paleosols from Sai Island, Sudan. GSA Annual Meeting, 9-12 October 2011, Minneapolis, abstract, 2011, 95-19. A.K. Thurmond, R.J. Stern, M.G. Abdelsalam, K.C. Nielsen, M.M. Abdeen & E. Hinz, The Nubian Swell. Journal of African Earth Sciences, 39, 2004, 401-407. P. Van Peer, R. Fullagar, S. Stokes, R.M. Bailey, J. Moeyersons, F. Steenhoudt, A. Geerts, T. Vanderbeken, M. de Dapper & F. Geus, The Early to Middle Stone Age Transition and the Emergence of Modern Human Behaviour at site 8-B-11, Sai Island, Sudan. Journal of Human Evolution, 45, 2003, 187-193. Simply a perfect start into the New Year – we arrived safely yesterday on Sai Island, early enough to enjoy the beautiful sunset! Today we got settled and are currently preparing everything to start excavating on Saturday. With the beginning of 2014, I have furthermore the pleasure to welcome two new team members of AcrossBorders, both of them will also join us in a few days on the island. Erich Draganits studied Geology and Prehistoric Archaeology at the University of Vienna. Within the Earth Sciences he is specialized in clastic sedimentology, deformation of sediments, landscape evolution and Earth surface processes. 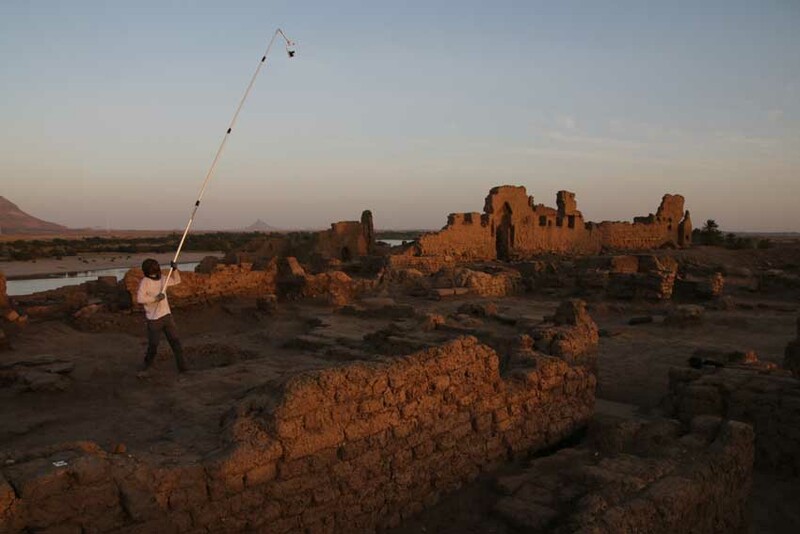 Based on his expertise and interest in interdisciplinary research he carries out geoarchaeological studies at numerous archaeological excavations including diverse sites, periods and countries like Austria, Italy, Greece, India, Turkey and now also Sudan. This January, Erich will conduct a first geoarchaeological survey (including drilling and test pits) on Sai – investigating the harbour situation, geological formations, sandstone quarries and more. He will closely cooperate with Konstantina Saliari and also Giulia d’Ercole who is investigating the clay deposits of the island related to her research on the local pottery production. Konstantina Saliari is the second newcomer. She has studied archaeology and prehistoric archaeology at Athens where she received her MA in 2011. 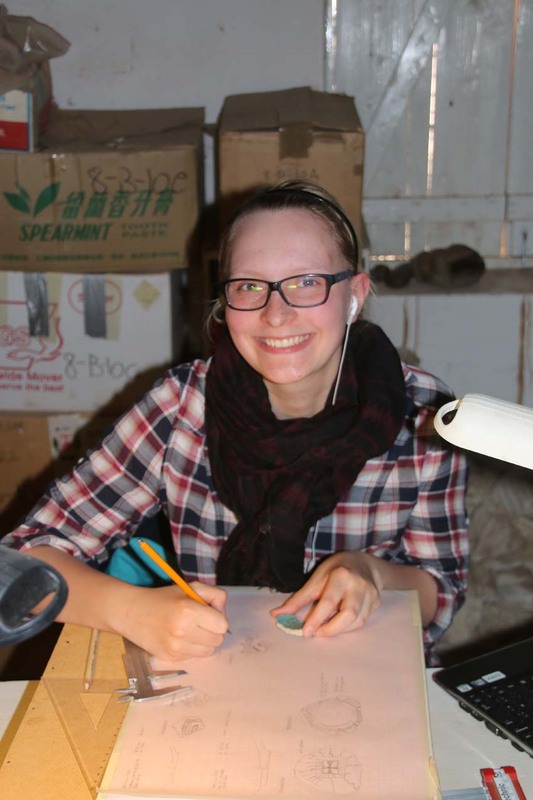 She is currently a PhD student of the University of Vienna and has joined AcrossBorders as researcher specializing in zooarchaeological remains. In the upcoming season, Konstantina will work on animal bones coming from the site of SAV1N within the New Kingdom town of Sai. 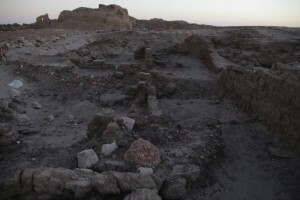 Environmental and climatic settings and changes are important issues for our research questions and the aim to reconstruct living conditions at Sai Island during the New Kingdom. We aim at estimating the human interaction with the landscape and will tackle the question of the location of settlement areas and cemeteries over the ages. Assessments of real living conditions in the past are essential to understand the relations of the Egyptians living on Sai with the indigenous Nubian population. Just one small example – from Egyptian texts, temple reliefs and wall paintings we have plenty of evidence that various wild and domestic animals were imported to Egypt from Nubia. Davies & Gardiner, The tomb of Huy, Theban Tomb series vol. 4, pl. 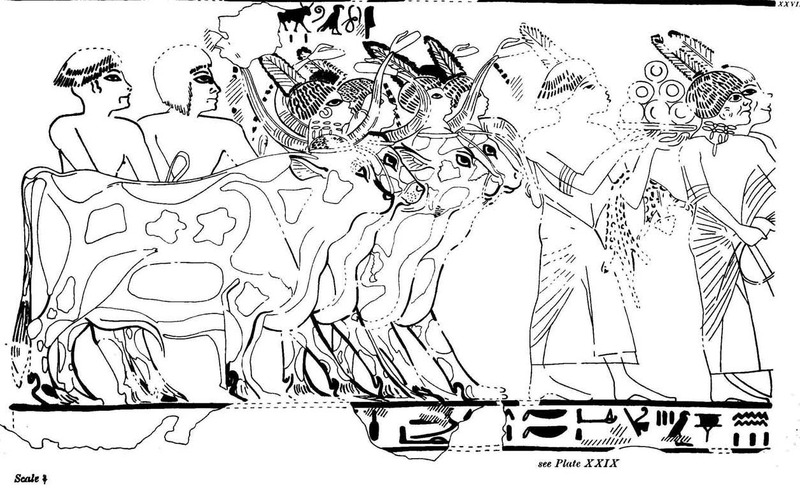 48: Boat with cattle from Nubia, being brought to Egypt. At least five different types of cattle are mentioned in the texts! For example, the beautiful paintings in the tomb of viceroy Huy at Thebes show jw3-cattle being brought from Kush. It is intriguing whether there are possibilities to reconstruct differences between cattle also in reality, using the corresponding bones. How do the actual remains relate to the texts and pictoral representations of Upper Nubian animals in general? What kind of wild and domestic animals can we trace at Sai Island and can we estimate their numbers? Davies & Gardiner, The tomb of Huy, Theban Tomb series vol. 4, pl. 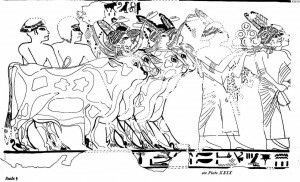 23: jw3-cattle are brought from Kush. Joint research by Erich, Konstantina and others will help to understand the environmental conditions on Sai – the expected new data will allow putting the island in a broader context and can also adress very detailed questions about living conditions in Kush. I am very happy to welcome Erich and Konstantina as new team members, looking forward to their first results this season!